Alegria at Delia Metcalfe offer a wide range of sandals and shoes in fantastically comfortable designs with gorgeous patterns. Many people get into the habit of wearing ill-fitting shoes for work and leisure. Alegria are different because they are designed with comfort in mind. 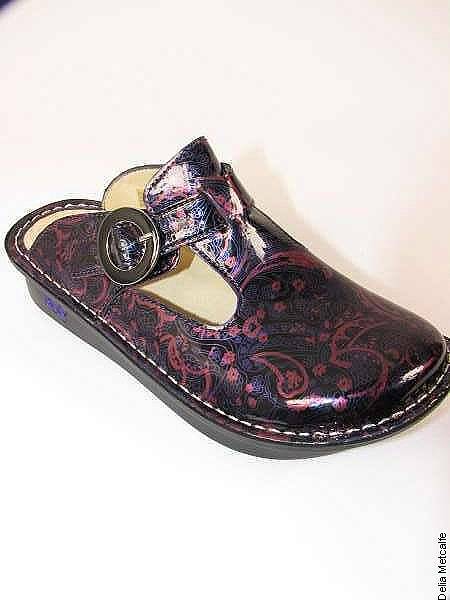 Women have reported working 12 hour shifts on their feet in these gorgeous shoes with memory foam latex and cork in the sole to keep your foot fully supported and comfortable all day. Delia Metcalfe stock a range of Alegria shoes, available to browse on Delia’s Pinterest and her website, including a large variety of mules, sandals and shoes in a choice of bright and dark colours and patterns. All Alegria shoes currently have money off – a great time to buy your first pair or update your shoe collection with a different style for leisure or work. Browse our collection of Alegria shoes at Delia Metcalfe and buy online today!